I’ve not run a competition on the blog before. I’ve thought about it a few times and played with different ideas but never actually taken the plunge. Well two things really, someone offered a lovely prize, one I’d be happy to have myself and when I asked Twitter the verdict was resoundingly that competitions are GOOD….. I assume everyone is hoping to win. So good it would seem that one cheeky chappy (he knows who he is) suggested I design the rules such that he was guaranteed to win, very naughty. And I won’t be doing that. So what’s the competition and what’s the prize? 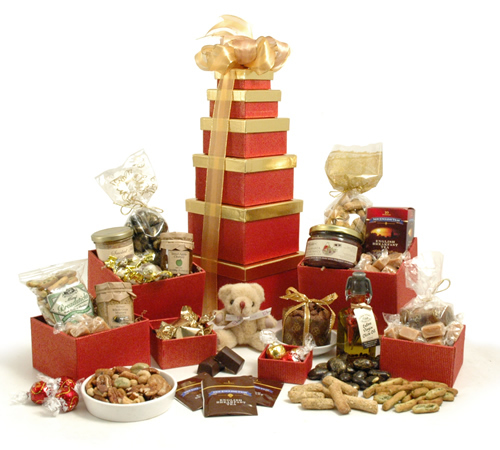 which has been supplied courtesy of HamperGifts.co.uk, who provide a wide range of hampers, chocolate gifts and mothers day baskets. I particularly like the fact that as well as the food goodies it comes in rather nice looking boxes, but that’s probably because I’m a bit of a stationery and storage fan, as evidenced by some of my posterous posts. So what do you have to do to be in with a chance of winning? Well you have to post a comment on this post by 20th September telling me what your favourite stationery item is. I’ll then pick a winner using a complex spreadsheet formula or much more possibly a random number generator. If you don’t list a favourite stationery item your comment won’t be included in the draw and if you comment more than once the earliest comment that meets the competition rules will be the one that counts…..so Dan there is little chance of rigging it in your favour…. Over to you to try and win the hamper. Please note the hamper will be dispatched direct form the supplier so if you are feeling very generous you could choose to send it to someone as a gift. Note that delivery can be anywhere in the UK except the Channel Islands, PO Box or BFPO Box addresses. My favourite stationary item is my post it notes, not only are they great for taking notes and doodling but they can also be good for silly name games. I also use them to set myself reminders around the home, such as one stuck on the inside of the front door reminding me to take something extra to work etc. Sooo hard but it would have to be a lovely journal style pad with paper that takes ink really smoothly and makes your writing look better than it is! Hardback cover, plain or patterned but no writing on the cover like “Notes” if you know what I mean. Well Linda as you know I love stationary, but, my favourite item? Well, that would have to be my Mont Blanc ball point pen because it was a gift from my dad when I had my first article published in a magazine. I will treasure it forever. .-= George@CulinaryTravels´s last blog ..Pistachio Brownies =-. Oooh! I’m well known for my stationery love. Favourite at the moment would have to be my animal shaped elastic bands! .-= The Graphic Foodie´s last blog ..TRAVEL- Sextantio Albergo Diffuso- SStefano di Sessanio- Abruzzo =-. OOh I lovelovelove a competition, and for such lovely boxes and stuff, got to give it a go. .-= Lynne´s last blog ..Galler Pralines Damned with faint praise… =-. I love a new notebook, especially with a spiral bound. Can’t write in it though. .-= Angela Elsworth´s last blog ..TV can be good =-. Stationary? Oh how could I choose between the heavily perfumed lined refill pad to a new packet of pens just waiting for me to rip off the packaging and write with but the most truly delicious is surely a new hard bound writing book, leather bound, rich and textured paper ready to receive my well chosen and formed prose – sadly the latter is probably never going to happen which is why I have piles of them waiting for my writers block to evaporate. My love of stationary came from shopping with my grandmother on my holidays. We would daily visit a post office come shop which always had a tempting range of pencils and paperwork for a 9 year old to sigh over. Happy memories and one I always remember when giving into temptation! My favourite stationary item is the good old “post it note” as I can leave little reminders for myself. A god send when living on your own. My favourite piece of stationary ever must have my Hubba Bubba rubber which funnily enough smelt of Hubba Bubba bubble gum. It smelt sooooo good that you could eat it. And I did. .-= Food Urchin´s last blog ..What Can You Do When Black Bottom Strikes =-. What a lovely competition. My favourite stationery item has to be my beloved Elysee fountain pen. It was a graduation gift from my parents and every time I use it I feel a huge wave of relief that I ever made it through my degree course! My favourite item of stationary is a plastic wallet. They make make even the most unorganised of people organised, keep everything tidy and crumple-free and are a great procrastination tool when you have infinitely more important things to get done than organising! I love them and buy at least 2 packets a month! .-= Ailbhe´s last blog ..Slow-braised Shoulder of Lamb =-. hmm, favourite stationary item? a pencil! simple, classic and surely one of the best designs of all time? i spend most of my time at my laptop writing for my PhD or on my iPhone for photos, blogging and twitter. but, when i go back to basics and actually write, by hand, i almost always write in pencil. not because i can erase it later but because i find it such a pleasure. my writing looks nicer and i can also write more quickly. .-= nancyflowers´s last blog ..sharland &amp lewis =-. I simply can’t live without my Jesus parcel tape! I see that lots of people still have problems spelling the word STATIONERY, so here’s my tip: remember it’s got an E for Envelope in it! Hi. My favourite stationary item(s) are my collection of moleskine diaries, notebooks, address books, etc. I love them. So pretty and actively encourages me to be organised. Yay. .-= Becci´s last blog ..A hangover from IHOP- Blueberry pancakes USA stylee =-. My favourite item of stationary has to be the humble paper clip. They are always laying around and are useful for not only the purpose of joining sheets of paper together, but also as an executive toy. I have whiled away many a boring telephone conversation or meeting straightening out a box of paper clips. They can also be useful for picking crap out from between the keys on your keyboard and for getting the dirt from under your nails when you can’t find an orange stick. The paper clip, I’d like to shake the hand of the person who invented it – it’s genius! .-= Lyndsay Deans´s last blog ..I became a Mrs and went away for 4 weeks! =-. .-= Whimsical Wife´s last blog ..Vbac versus C-sec =-. My favourite is my leather notebook from Aspinals. My mom and dad buy me one every year for my scribbles and i’d be lost without it. Wow that’s one great prize, after food, my seconds love is stationery – I have my own stationery cupboard in my house. I love patterned envelopes and fun postcards, I adore stickers, but my fave item is a purple pen with a kitten on Extra special as I thought i’d lost it once but found it again. Thanks! .-= Erin´s last blog ..Car Boot Bargains - =-. My favourite item is an Orla Kiely notebook. I have used it to make notes for my wedding, pregnancy and life with my little one and there’s still a few pages left to fill! .-= Jenny´s last blog ..Cath Kidston Badge blanket =-. Hi my favourite stationery item isn’t just one item but a travel pod of items. It’s a little plastic pouch that contains – Stapler, Hole Punch, Scissors, Sellotape, Paperclips, Mini Pen & Pad, Staple Remover, Staples and a Highlighter Pen. It lives in my handbag and goes on everywhere with me (even on holiday), you never know when a stationery emergency will occur, and I’m always prepared. I love stationery, Oh I sound really sad now, I don’t care, I love my travel pod. I’m torn by my favourite stationery items. I have a practical favourite and a “make me feel good favourite”. I love these gel pens from muji, (http://www.muji.eu/pages/online.asp?V=1&Sec=13&Sub=52&PID=1004) They don’t smudge like some of the other ones out there. I tend to treat myself to the 15 pack (http://www.muji.eu/pages/online.asp?V=1&Sec=13&Sub=53&PID=588) at the start of every new year and start out with the best intentions with different lecture topics being in the same colour but by the time I’ve been in a couple of weeks this goes out the window. My second second obsession is with Papyrus, who used to do some gorgeous journals but they don’t seem to do them online anymore. http://www.papyrusonline.com. Papyrus are an american firm that whenever I’m in the states (or someone close to me is going) I request a new journal. I have a beautiful journal that I use for recording photography information, plus I have another that I use for reflective practice as I’m currently studying to be a nurse. Papyrus also do some beautiful cards and invitations, and I’ve bought extra journals back with me when I’ve been and given them to friends when they find they are pregnant to record their thoughts/feelings etc. .-= MyFuzzyLogic´s last blog ..The cook books 4 =-. My recipe folder full of plastic wallets to keep my recipes safe and clean. Hi, many thanks for an opportunity to win this fab prize! Stationery is an important part of a crafter’s life. Love good quality paper and envelopes etc etc the list might be endless. My favourite piece at the moment is my Moleskine diary, a gift from my DH. And just look at that wonderful prize. I think I am smitten by the storage boxes as much as by anything inside. I am forever stashing boxes to alter them as gifts. .-= Greensleeves´s last blog ..She sells seashells =-. .-= Nora´s last blog ..Saturday round-up of deliciousness =-. Can’t believe I’m about to admit this because I am also ashamed of it. My favourite stationary item is the plastic wallet. I’m not proud. Of course I mean ‘stationery’ – not just an item that is still. I adore stationary at the moment I love Waldo pancake items especially the notebook Warning: Contents may be boring” and the pencil case “use as v. small pillow” the funny phrases on all the items, love novelty bits. My favourite stationary item is/are my card folders, vital for keeping everything I am working on in order. My favourite, like you are my desk boxes. Recycled from Miller Harris perfume presents, they are capacious and manage to make my office look bright and contemporary with their bold yellow prints. Lovely. I’m a big propeller pencil fan myself. Pencil technology has come a long way since the old days of bits of lead breaking off in your pencil sharpener. Wihout question the bic biro. Nothing else has changed the face of writing across the world. I’ve even exchanged a pack of them for a wooden giraffe in Namibia! They can’t get enough of them! Love my colourful blank cards that I can decorate with stamps and embossing powder for a more personal touch! .-= Marina´s last blog ..Cafe Luc =-. My favourite item of stationery is my magnetic notebook with attached pen that lives on the fridge. It is great for noting down items for the grocery list as well as phone messages, etc. My favourite item of stationery machinery is our laminator. It is really fab for preserving the kids artwork, my recipes, loads of things. I don’t know which to salivate over more – the goodies or the boxes. I share your storage mania. Stationery, I looove stationery. I have to sneak it into the house now as Pete (quite fairly) points out that I have more than I can use in my lifetime already and don’t need any more. Of course, he’s talking about practical need not emotional need which I think is a very different thing. Best of all, I use the notebooks for travel diaries so I can remember all the funs of a holiday – just got back from Kenya yesterday and have all my sightings and experiences recorded in a wee stripey hardback spiral bound brown paper jobbie! .-= Kavey´s last blog ..An Animated Lunch at Francesco Mazzeis LAnima =-. I don’t know if this is strictly an item of stationery, but a sellotape dispenser. I sellotape packets and bags of food items that I open, then put them back in the cupboard. .-= Jan´s last blog ..Theo Randall at The Intercontinental =-. .-= sweet-komal´s last blog ..Fancie =-. .-= Lucy´s last blog ..Celebration Chocolate Log =-. My favourite stationery item is a very old sellotape dispenser, which can also serve as a hammer for knocking drawing pins into stubborn walls. my favourite stationery item is my to do list. Ok so maybe it’s not quite a stationery item, but it’s created by stationery items. Keeps the wheels from falling off. Postcards. Simple, plain, white postcards. Usually used for entering competitions that are easier than this one to answer! A paper clip is my favourite, as you always need one to remove CDs out of an Apple Mac (or floppy discs as it used to be!) or to get into a reset button! OOOh, those smelly pens or erasers. Reminds me of school in a good way. Or those click pencils, click click click. .-= Zara´s last blog ..Glass Feet and Warrior Cats =-. Fountain pens! Love me a fountain pen. No one uses them anymore, do they? .-= Siany´s last blog ..Etsy Pick- Rocket Racer Print =-. My favourite peice of staionary has to be the berol handwriting pen.. I loved using this pen at school and all these years later i still use this pen to write with. I like the fact that everytime i use the pen especially when writing letters it takes me back to my school days and for some strange reason my writing always looks neater and nicer when i use a berol pen!! My daughters school sell them for 25p so bargain to. I love competitions! My favourite stationery is a box of Winnie the Pooh stationery that I bought in Wales. I use it to write to my grand-daughters. The box itself is rather nice being bright red with a large Winnie on the front, but the writing pad and envelopes are so nicely decorated that I really enjoy using them. .-= sociolingo´s last blog ..Entrepreneurial programme to foster the growth of software companies in Africa =-. I have a special Bagpuss notebook and Pen where I keep a note of all my comps that I enter and any prizes Im lucky enough to win.